168:01 – A Library Rising from the Ashes on display at the Aga Khan Museum in Toronto. Books are art objects. We speak of beautiful books, and this is partly a reaction to their aesthetics and partly out of a sense of the sacred: we attribute a magic quality to these oblongs. We love their weight, as if their wisdom were measurable in their mass. We put them on display, sometimes even behind glass. Hence their long-standing decorative function. There is no more comforting wall covering than a bookshelf. This has led to variations on the bookshelf as decor: there are bookshelves of fake ancient books, bookshelves of books arranged by colour rather than content (whole Pinterest pages of them, in fact), bookshelves of plain white non-books (who hasn’t been in that chic boutique hotel lobby?). In design they are symbols of class, but they can just as often symbolize emptiness. What it in fact implies is loss. In 2003 the University of Baghdad’s College of Fine Arts was destroyed by looters. Seventy thousand volumes were lost to fire. It was a final indignity for a country that had already endured dictatorship, terror and war. The artwork is an interactive one: It will change as visitors replace its blank books with real ones. Each visitor may select an educational text from a wish list provided by a group of retired Canadian librarians, buy it and donate it to the bookshelf. A library will thus grow and the white surface will gradually metamorphose into variegated colour as real books bloom in it. When the new library is complete, it will be returned to Baghdad. 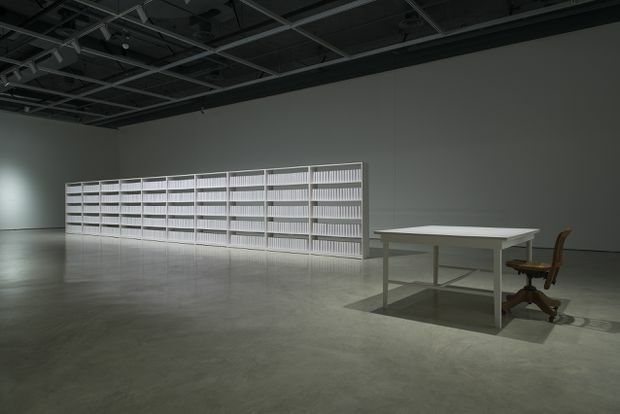 The title of the work refers to a legend in Iraqi history: when Mongol invaders destroyed a library in the 13th century, they threw the contents of an entire library into the Tigris. The books were said to bleed ink into the river for seven days (168 hours), until the were drained of their knowledge. The number 168:01 refers to the first hour of their reconstruction, beginning now. The collection planned by the librarians is based on the libraries of fine arts schools around the world and so does not attempt to recreate what the original Baghdad library had, but to start afresh with a 21st-century collection. The work is then both practical and aesthetic. It combines art and reconstruction. The Aga Khan Museum is a beautiful and meditative place. It is not downtown, but floating above the city in a maze of highway overpasses and industrial plazas, a place of flatness that suits its austere desert aesthetic. It is surrounded by blazing white marble grounds and black reflecting pools: it feels like a moonscape. Inside, it is cool and dim and soaring, with light diffused by patterned screens. It is a miraculously calming place – and because it is full of religious and ancient art, it feels fundamentally apolitical. This beautiful and performative new piece – an act of literal regeneration – is a welcome challenge to its demure mandate.